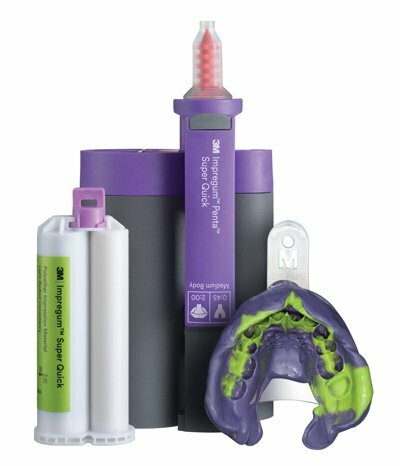 New 3M™ Impregum™ Super Quick Polyether Impression Material – the trusted performance of a polyether with the speed of a VPS. Impregum Super Quick is available in three viscosities, heavy, medium and light body and can be used in monophase and 1-step impression techniques. All materials have a working time of 45 seconds and an intra-oral setting time of 2 minutes, making them perfectly suited for single-unit restorations like crowns, implants, inlays/onlays and smaller bridges up to three units. The short intra-oral setting time combined with an improved fresh, minty taste offers enhanced patient comfort. The new material also has the trusted polyether benefits: moisture tolerance, great flowability and a consistent flow throughout the whole working time—for highly detailed and accurate impressions. For more information visit 3M.com.au/ImpregumSQ or 3M.co.nz/ImpregumSQ or call 1300 363 454 (Australia) or 0800 80 81 82 (NZ).